Paturi recipe is a special way of cooking which we can apply for any fish, but here we will discover the steps to prepare Bhetki fish paturi recipe at home. In Bengal we prepare mostly Bhetki paturi or hilsha paturi. If you are a vegetarian, then go ahead and try this with paneer or with some other vegetables. You will definitely enjoy the preparation as well the food. Let’s see how can we make Bhetki Maacher Paturi at home easily. Wash the fish pieces properly and keep them separately in a plate. In a bowl mix oil, turmeric powder, mustard powder, chili paste, grated coconut salt and sugar. Now add the fish pieces to the bowl and mix them all. Carefully marinate each piece so that a good layer is created outside each fish and then refrigerate them for 1 hour. By the time wash the banana leaves properly and makes them dry. Next oil one side of the banana leaf in which the fish pieces will be covered one by one. Put the fish piece on that and cover the leaf and bind/wrap the fish inside banana leaf with some thread/string. Apply the same step for rest of the fish pieces. Now heat a pressure cooker in a low flame. Need to steam the banana fish wraps in that for 15 min. You can also use microwave to cook them. Fish pieces will be cooked inside banana leaf in a spicy mustard mixture. 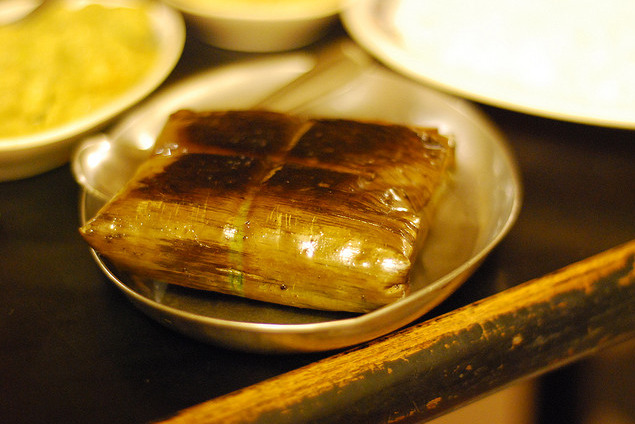 Serve the banana leaf wrapped fish pieces with steamed rice. You can now open the wrap and enjoy aroma as well as taste the juicy bhetki fish paturi recipe. It’s a terrific recipe. Try this with paneer/vegetables also and let me know how did you enjoyed making this dish. For how long will we keep in the microwave? And we do this recepie in microwave without banana leaf? For bhetki paturi in microwave, you need to cook it for 20-25 minutes. You can cook bhetki paturi without banana leaf, but this recipe tastes better with that.